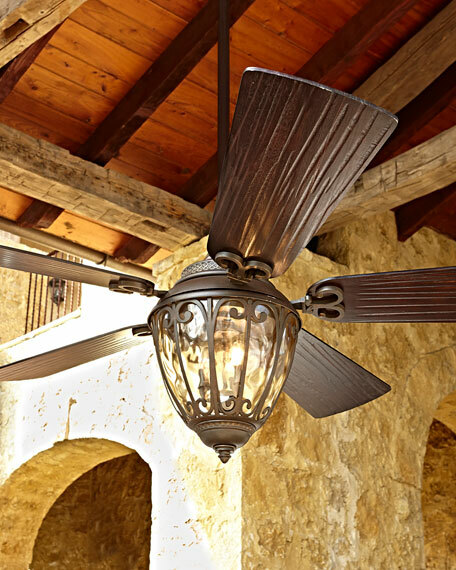 Ceiling fan specifically designed to make covered outdoor living spaces more comfortable. For use in covered areas outside; pretty enough to be used indoors, as well. Crafted of steel and wood with an aged bronze and walnut finish. Blades are hand scraped for nice texturing. Six-speed, remote-controlled motor offers the ultimate in air circulation with the minimum of power consumption. Included light kit features a scrolled metal overlay on clear water glass. Includes 5" canopy, hanging bracket, and 6" down rod.